Headliner: David Curle, Director and Lead Analyst, Outsell, Inc.
Open access to law is a central mission of many different types of organizations. However, open access must be paid for, and if not by its users, then by whom? Over the years, different open-access providers have discovered different funding models appropriate to different national and institutional settings. Some operate in universities, some in government, and some in the private sector. Some are hybrids or partnerships. All have different sources of revenue, support, and cross subsidy. All operate in different markets and different business environments. 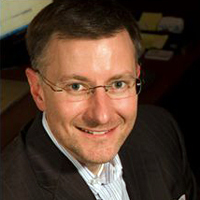 Ed Walters is the CEO, member of the board of directors, and co-founder of Fastcase, an online legal research software company based in Washington, D.C. Under Ed’s leadership, Fastcase has grown to one of the world’s largest legal publishers, currently serving more than 500,000 subscribers from around the world. Before founding Fastcase, Ed worked at Covington & Burling, inWashingtonD.C.andBrussels, where he advised Microsoft, Merck, SmithKline, the Business Software Alliance, the National Football League, and the National Hockey League. His practice focused on corporate advisory work for software companies and sports leagues, and intellectual property litigation. Ed worked in the White House from 1991-1993, first in the Office of Media Affairs and then in the Office of Presidential Speechwriting. After working in the White House, he was the lead account executive in an influential Washingtonpublic relations boutique. He has written for The Washington Post, The New York Times, The University of Chicago Law Review, The Green Bag, and Legal Times, and has spoken extensively on legal publishing around the country. Ed earned an A.B. in government from Georgetown University and a J.D. from the University of Chicago. He served as the Editor-in-Chief and Chairman of the Board of Directors of The Hoya, Georgetown University’s college newspaper, and during law school, he served as an editor of The University of Chicago Law Review. From 1996-97, he served as a judicial clerk with the Hon. Emilio M. Garza on the U.S. Court of Appeals for the Fifth Circuit. He is a member of the Virginia State Bar, and the District of Columbia Bar, and he has been admitted to practice in the U.S. Supreme Court and the U.S. Courts of Appeals for the Fourth Circuit and Fifth Circuit. He serves on the boards of Pro Bono Net, Democracy in Action, Friends of Telecom Without Borders, and Save a Child’s Heart Foundation. He has served on the Visiting Committee for the University of Chicago Law School, and the Visiting Committee for the University of Chicago Main Campus Library System.